Austrian physicist and mathematician; born March 7, 1860; died Dec. 15, 1893, at Stecken, Bohemia. After receiving his early education at the gymnasium of Iglau, Moravia, being graduated in 1877, he entered the University of Vienna, and received the degree of Ph.D. in 1882. He then devoted himself principally to the study of mathematical physics, and in 1885 was appointed "privatdocent" (instructor) at the university. Shortly before his death he was promoted to the position of professor extraordinary at the same university. 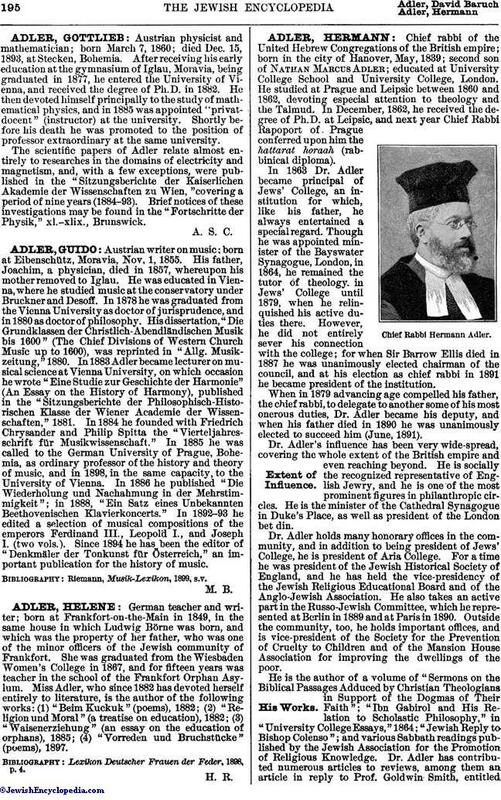 The scientific papers of Adler relate almost entirely to researches in the domains of electricity and magnetism, and, with a few exceptions, were published in the "Sitzungsberichte der Kaiserlichen Akademie der Wissenschaften zu Wien," covering a period of nine years (1884-93). Brief notices of these investigations may be found in the "Fortschritte der Physik," xl.-xlix., Brunswick.